Would you agree that the Herpes Virus is one of the most stubborn and nasty microorganisms invading our bodies? This tiny intruder sneaks in quietly, most commonly in our childhood, with chickenpox (Herpes zoster, or shingles) or through parents who carry the virus (Herpes simplex, or cold sores). It takes residence in the nervous tissue and lies there silently until one day it bursts out in painful blisters – and then it retreats back, until next time, but it never leaves for good. Actually, “herpes” is a Greek word that means, very appropriately, “creeping” or “latent”. VZV (varicella zoster virus) – the most vicious of all that usually causes shingles. And everyone knows that once the virus is activated and those painful oozing blisters show up there is not much you can do but wait until the attack takes its course, blisters burst, ulcerated skin heals, and the virus become dormant again – and that may take some time, especially in the case of shingles. There are no ways to predict or prevent a new attack, or to eliminate the Herpes virus from your body – unless, of course, you get vaccinated against Herpes zoster, but do you really need another vaccine in your system? There are, however, a few reports here and there that show that the Herpes virus is sensitive to ELECTRICITY and that the electrical current can substantially speed up the dynamics of the virus outbursts and often keep the virus in the latent stage longer. Incidentally, that very much goes in line with Dr. Tennant’s “Healing is Voltage” theory (see HERE): sufficient increasing of the local tissue voltage promotes healing. In the video below filmed at the HealthBoss University LIVE 6-17 event Edite Pednault, Dip physiotherapist and occupational therapist, validates these findings sharing her experience of treating 100 clients with various types of Herpes virus with electrotherapy, very successfully. And even though Edite didn’t use SCENAR or COSMODIC (which she didn’t have yet at a time), there is no reason why YOU shouldn’t. Sophisticated as it may be, it is still electrotherapy. The video gives you the exact technique for treating the Herpes virus with electrical current. Treat the entire branch of the affected nerve, starting from its origin (in most cases, somewhere on the cervical or thoracic spine) to its end near the front middle line (the visible blistered outbreak will be somewhere in-between). This way you are “increasing the voltage” of the whole nerve, which usually suffers in its entirety regardless of how much shows on the surface. The above is most efficiently achieved with a pair of remote electrodes that you can position at the ends of the chosen segment and switch halfway. Let electricity run through the affected nerve for 1 min. on the lowest energy setting (hardly perceivable). Repeat the above, but now positioning the electrodes to the sides and close to the site of the outbreak (the sore itself). You can expect the results within 8 hours with cold sores and within 3 days with shingles (I believe, the latter with daily treatments). Considering that Edite Pednault used a different device to generate the direct and alternating electrical current, how could we adopt the technique for SCENAR/COSMODIC? I would suggest the following adjustments. Use a pair of shungite remote electrodes with your device. Any spheres or semi-spheres will do, but the mini-spheres (12-16mm), while sufficient to work on the face, may not be enough for the rest of the body. 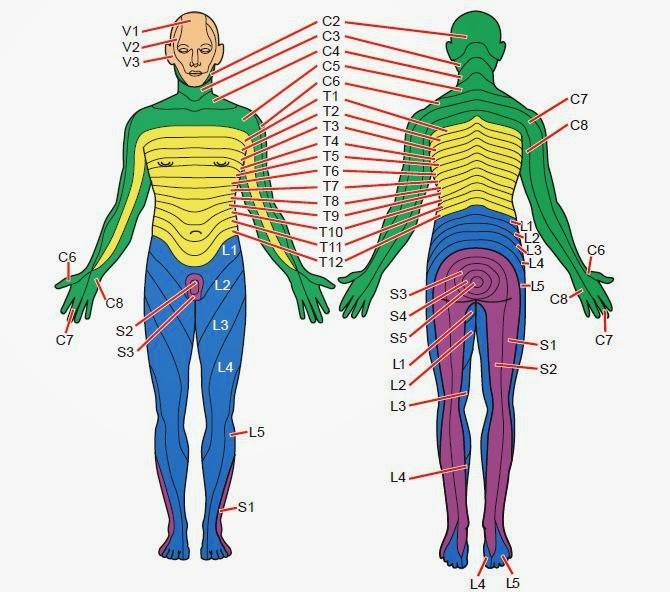 As per the above protocol, place one of the electrodes on the vertebra correspondent to the affected dermatome (see a picture on the right – or find a better one in Google Images with a term “dermatome chart”). 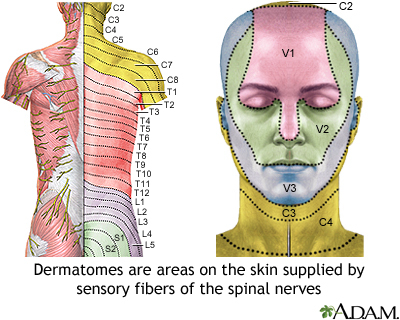 Place the other electrode at the end of the dermatome in the front. Use the lowest energy level and the widest variety of settings available on your device (Swing modes on RITMSCENARs, SCENAR-COSMODIC Slider Auto on EX735 etc.). After 30 sec. reverse the electrodes making the entire treatment last only a minute. Reposition the electrodes to put the herpes sore in-between them and do another minute also reversing polarities halfway. For the facial sores, you may also try to put one of the electrodes at the exit point of the appropriate branches of the trigeminal nerve on the face (as per the “6 points on the face” from the 3P6P SCENAR protocol). DISCLAIMER. The above recommendations are my SUGGESTIONS only; I cannot vouch for the effectiveness of the technique. I did not try it in practice myself yet since, thankfully, no one in my immediate surrounding has any type of herpes. I, however, intend to do so on the first occasion. So what do you say, Home Healers? Should we try to zap the Herpes virus? And if you decide to do so, PLEASE let us know about your experience – in the email to support@healthboss.org or in the Comments box below. Your results can help so many others! Thank you in advance for participation. (KSHV or HHV-8) etc. These viruses primarily reside in white blood cells and are outside of the scope of this article since their symptoms are quite different from the neurotropic Herpes viruses and we do not have any direct experience of treating them. Am so happy today because I am free from Herpes (herpes simplex virus-2) infection. I have been having herpes since the past two years now, and I have passed through many different processes in getting cured from the diseases of HSV2 but nothing was working out. A friend of mine introduced me to a doctor Dr Linda (Best Health Herbal Centre) who sent me herpes herbal remedy and my life get transformed and everything is fine and okay with me. Till now I have been going to check up and it is now going to four months and I am still negative…Thanks to Dr Linda, I will never stop telling the world about your good work..
What did you use for treatment?? Irina…Thought you might be interested to know that I discovered and designed the First patented treatment device for Herpes Simplex 1 and 2 in 1985. My first patent was issued in 1990. I have several. The results are published and the treatment is permanent. My device is called: The cold sore eliminator. I no longer make money from it as I sold the rights in 1995 for 2 million dollars. It is, however, still being sold on the Internet. What if i’ve Never had an outbreak of HSV, but I’m positive. How can I get rid of it??? Thank you!